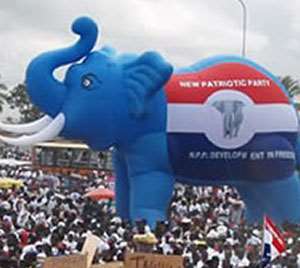 Mr. Joseph Yaw Acheampong, the incumbent Chairman of the New Patriotic Party (NPP) in the Abirem Constituency has lost his seat to Mr Patrick Baffour Bannor. Nana Danso Abeam, incumbent First Vice Chairman retained his seat by obtaining 204 ballots as against 173 collected by Mr. Charles Aggrey who had 173, while the position of Secretary went to Mr Evans Osei Yeboah who had 282 votes with Mr Frank Mireku who one time occupied the position collecting 202 ballots. Ms Ivy Grace Dokuah, incumbent Constituency Women Organiser won the position for the fourth consecutive term in office with 343 votes while Ms Esther Bonsu her only challenger obtained 123 ballots. Other constituency executives elected were Mr Douglas Adomako, Assistant Secretary, Organizer, Nana Boadi Amponsah, Youth Organizer, Frank Ayim Owusu and Second Vice Chairman, Teye Larweh Joseph. The rest were Treasurer, Bennet Boateng, and Yusif Hashmin, Nassara Co-ordinator. In his victory speech, the newly elected Chairman, Mr. Bannor thanked his colleagues for the confidence reposed in him and promised to work hard to ensure an overwhelming victory for the NPP in both the presidential and parliamentary elections in 2020. He renewed his campaign promise to ensure the construction of constituency offices for the party during his tenure of office.